The KRW2,200,000(USD$1,888) Main Event attracted 160 runners this time around, with many familiar faces taking their seats on the first two days of play. As day 1a came to a close, there was an exciting prospect in store for the fans, as two names who had been very successful in side events were vying for top spot on the chip counts. Jason Lo and Juicy Li were once more trying to outshine each other, and finished the day in 1st and 2nd on the leaderboard. Day 1b saw them joined by Sam Ng and High Roller champion Alex Lee, as both players built large stacks to take forward into day 2. The action on Day 2 was perhaps not what the fans would have hoped for, as the bigger names were decimated in the field. By the time we had our final 9, the only familiar names were Phachara Wongwichit and Henrik Tollefsen. The final table didn’t spring any major shocks, although many will have been a little surprised that Xi Jie Sun couldn’t convert his large chiplead into a win. He can still take pride in his 2nd place finish though. He was bested by one of the chasing chipstacks, that of Yiguang Xu from Shanghai, who only had a single live cash recorded to his name before today. Phachara Wongwichit managed 4th place which sees him continue his great start to the year. The side events during this festival were an interesting contrast to the Main Event, in that signed pros and big names featured heavily at the final table stage. In fact, PKC saw two of its players lift side event trophies during the week, and will undoubtedly view WPT Korea as a great success. The action kicked off with the KRW550,000(USD$472) Poker King Cup, where 118 entries were involved. Sixiao “Juicy” Li made the final table, but it was Fan Fan who took down the event, and pocketed the KRW17,136,000(USD$14,720) prize money for 1st. 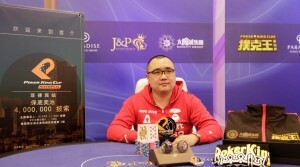 The KRW550,000 Bounty tournament saw Poker King Club team pro, Jason Lo overcoming a field of 50 runners to win the title, and KRW8,314,000(USD$7,101) cash. The KKW880,00 buy in NLH Deepstack saw Juicy Li match, and perhaps surpass the successes of her team mate Jason Lo this week as she took down the event. She will be particularly happy with the result, having already managed a final table finish in the Poker King Cup.